The Illinois Department of Children and Family Services (DCFS ) has new leadership in Richard H. Calica, A.M. ’73, who was named director in December. 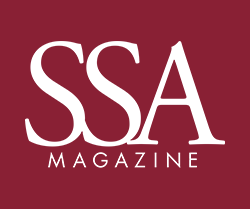 Calica and Mark Courtney, a professor at SSA , recently sat down to discuss Calica’s plans for DCFS and thoughts on its role, statewide standards and the importance of evidence-based practice. 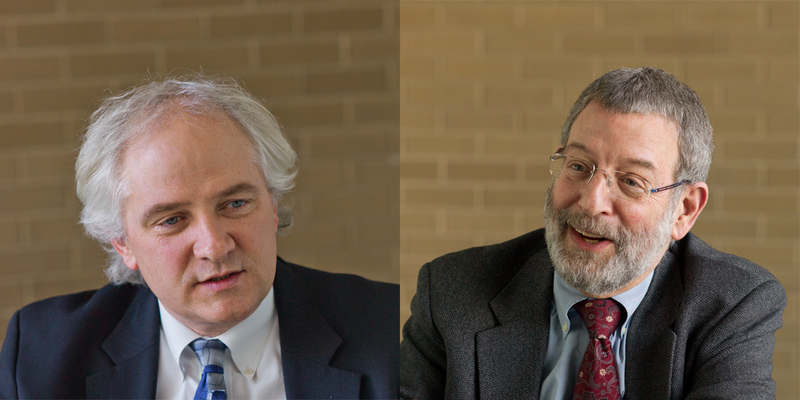 SSA Professor Mark Courtney and new Illinois Department of Children and Family Services Director Richard H. Calica discuss Calica’s plans for DCFS, thoughts on its role, statewide standards and the importance of evidence-based practice. In an extended online segment, the conversation turns to voluntary placement, standards for DCFS care, and what services the agency should provide to parents and children. The Illinois Department of Children and Family Services (DCFS) has new leadership in Richard H. Calica, A.M. ’73, who was named director in December. For 33 years Calica was the executive director of the Chicago-based Juvenile Protective Association. Under his leadership, JPA continued its core mission of providing direct services to abused children and their families and added consultation, training and research. Integral in writing legislation requiring the adoption statewide of a Child Endangerment Risk Assessment Protocol, Calica has been a field instructor at SSA and served on the School’s Alumni Board from 2003 to 2004. Calica and Mark Courtney, a professor at SSA , recently sat down to discuss Calica’s plans for DCFS and thoughts on its role, statewide standards and the importance of evidence-based practice. Courtney’s research centers around child welfare policy and services, the connection between child welfare services and other institutions serving vulnerable populations, and the professionalization of social work. An affiliated scholar of Chapin Hall at the University of Chicago, he received the 2010 Peter W. Forsythe Award for leadership in public child welfare from the National Association of Public Child Welfare Administrators. Courtney: Child welfare is seen as the public institution responsible for preventing children from being harmed— essentially the state becoming the parent. So what do you see as the actual role of the state agency, and what other institutions, formal or informal, do we need to rely on for it to do that? Calica: Well, I’d like to first say that every child needs a parent, not a state. So in the first instance, all of this is the responsibility of the family, not the government. But in terms of DCFS, I have a very narrow view of what our role is: We are the arm of society that intervenes when a family has so violated our standards that the state has a right to step in to and say “stop.” Within that context, I’m rather conservative in the sense that as long as biological existence isn’t threatened, I think that we have to proceed cautiously before assuming that removing children is the answer to their issues of safety and well-being. First do no harm! Now, I think there are a lot of other things that we do that could be considered “prevention.” But those are really targeted to families that have the characteristics of those who are the most highlylikely to come to the attention of DCFS. So we do a lot of geomapping of where most of our reports and custodies come from. I have no problem trying to provide family-enhancement services if there’s a good chance that I’m likely to take your kid away anyway. The other biggest problem we have, I think, is that we get very lost once we’ve taken custody. Granted, we’ve now become the parent, so a whole variety of child issues become our problem, like education, medical care, etc. But we totally lose sight of the fact that there were a set of under lying causes and contributing factors that made that family incapable of handling that child and that the sometimes necessary “cure of removal” has most likely further traumatized children. Courtney: There are a couple things you talked about that I’d like to comment on. One is the standards by which we intervene, even when we apply the kind of narrow standards that you’re applying, which makes a lot of sense. You say the standard is biological harm, which I think quite often the public doesn’t understand. And I think a lot of people in the system—including a lot of professionals—don’t understand. They get caught up in what’s the best for the child, etc. But ultimately the grounds on which we’re removing children is that the parenting is beyond the pale. Then once we remove them, though, quite often we get caught up in all kinds of other standards as to when we would send them home. Calica: There’s an interesting problem in that once you damage the child by removing them from the home, in order to be able to help the kid recover from that trauma, you have raised the standard as to what minimally active parenting is. Courtney: That’s absolutely right. I think that’s an interesting observation. I think the evidence suggests that for the most part, placement is a traumatic experience for the children and their families. So we had some standard of unacceptable parenting, and in some cases a high standard, which the family didn’t meet. Now we’ve intervened, traumatized the kid, traumatized the family, and we have a process of determining that adequate parenting, and then only adequate parenting, is taking place. There are number of child welfare organizations in the country that are struggling with the idea that there’s a ruler. The ruler was this long when it came to removal, and suddenly it got a lot longer when it comes to return. I think the agency plays a role, and I think the courts play a role. So how do we get the courts and the agency, all playing together? Calica: Well, it’s interesting. Nancy Salyers, who was the presiding judge of the Child Protective Division of the Juvenile Court of Cook County, put me in charge of a group of lawyers and judges to define “urgent and immediate necessity,” [the standard the court uses to determine if emergency custody by DCFS, doctors or the police was legally justified], because they had no definition. I said, “Wouldn’t it be a novel idea if you cross-examined social workers on the child endangerment risk assessment protocol variables that they’re supposed to be using to remove kids, rather than whatever your collective or individual fantasies are about what good parenting is?” That is, what exactly is the evidence for danger? But the problem is that the state’s attorney has one set of standards: [The parents] must admit that they’ve done something wrong before I’ll ever consider giving your kid back. The public defender says, “No, you can’t do that, because then you’re going to be found guilty.” And the guardian tries to represent what children say they want and what the guardian thinks is in the best interests of that child—and no one has the capacity to state the future probability that a particular parent will do severe harm to that child. Courtney: [SSA Emeritus Professor] John Schuerman and some other people did a study where they brought experts—child welfare workers, judges, researchers—and they had them read vignettes that described families where children were considered to be at risk of maltreatment and asked them to decide: Would you leave the child at home, would you open the case to in home family services or would you place the child? And the agreement across these experts was very low. In another study at Chapin Hall, Clark Peters, [A.B. ’88, A.M. ’06, Ph.D. ‘10], looked at what factors appeared to explain which foster youth had remained in care past age 18 in the state. Here in Cook County, 85 percent of seventeen-year-olds in foster care were still in care on their nineteenth birthday. Downstate it was half. He collected data from key players in the system from around the state to figure it out. He found that the difference had very little to do with the characteristics of the kids; it had much more to do with decision-making in the courts at the county level. And even the agency is influenced by that. If you’re a [DCFS] worker, over time, you know that in your community, these kids aren’t going to be able to stay in care past eighteen. Maybe it’s community norms: The judge thinks, “My kid was on his own at eighteen,” or that the rents are cheap here, or there is a perception that there are no services for kids after eighteen. So how important is sensitivity to local norms in a state system where you’re coercively intervening and taking their kids away, and doing that in a way that’s consistent around the state? Calica: I don’t believe that the people in Carbondale are of a different genus and species than the people in Chicago. I love that, as a consultant, I can go somewhere else, and they’ll say, “Oh, you could never understand our problems because they raise people in New York City differently than in Chicago, than in Nevada.” So I think there needs to be uniformity in rules for decision making. Courtney: Before I moved to Chicago, I’d worked in California and Wisconsin, which are both county-administered human services systems. I learned in those states that if you were looking for an example of something, you could generally find it because counties were experimenting with many things. The problem, though, is that there was virtually no effort, really, to standardize practice across these states. And that was seen as acceptable. I think there are some real social justice issues around that. Courtney: It’s fascinating that the children’s rights advocates have never sued around this issue, that I’m aware of. When I came to Illinois, what struck me was a missed opportunity on the other side of things. Illinois can and actually does try to do things consistently around the state, but sometimes, I think, to its own fault. There will be an interesting idea or innovative assessment, and typically Illinois implements it statewide. It doesn’t really test out what is the theory of change, what is the target population, what would evidence of success be, and how can we try it on a scale where we can actually learn? It seems to me that state-run systems are really the place to do that. Calica: I agree with you. I’m not going to run the system that way. I like innovative ideas, but I want to test them out. The problem with innovative ideas, I think, is that the state and private sector social workers latch on to new approaches and treat them as if they are the magic bullet to fix all the problems of child abuse and neglect. If you actually believe that you have discovered the cure for child abuse and neglect, you can’t do randomized controlled studies because now that you know you have the cure, how could you deny anyone this treatment? Read the extended conversation here.